On 14 September Ocean & Earth Science celebrated the launch of its new miniature remotely-operated underwater vehicle (mini-ROV) facility at a reception on the National Oceanography Centre Southampton quayside. 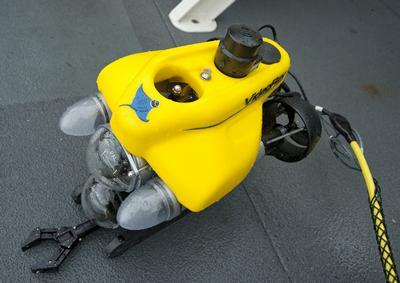 The mini-ROV, which is a joint venture between the University and the Natural History Museum, is a state-of-the-art tool in marine research and environmental consultancy, and the first of its kind in the UK to be equipped with a high definition video system for seafloor observation. It can dive to a depth of 300 metres and carry experiments to and from the seabed. The new vehicle will also help Ocean & Earth Science to share their work with the public, through events where video is streamed from the seafloor to audiences ashore. The first of these events will take place on September 23 with a live link from Southampton Water to the David Attenborough Studio at the NHM in London. We are excited to have this new facility for teaching, which enhances the University's position at the forefront of marine science education.